ZodTTD, the creator of all those super emulators announced that CraigX (one of the creators of the Pandora Project) has been working on a joystick (control-pad) to play those loved emulator games. I’m personally a big fan of all of ZodTTD’s work, but playing a action game with the on-screen controls is not what i call enjoyable. According to the developer the mod attaches to the dock and wraps itself nicely around the iPhone, giving it a psp kinda look, another bonus feature of the mod is the fact that it serves as a protective case as well. 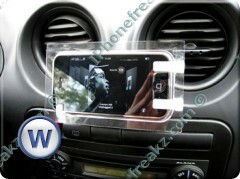 How to make a iPhone car stand with parts your received with your iPhone ? Some people are really handy man, take this guy for example.